The Medeo furniture series was exclusively designed for a private client. The series consists of a modular round sofa, a chair and an armchair, as well as a side table, a coffee table and a generous dining table. The complex geometry of the frame of the armchair is made of white oiled ash and creates – in combination with the hand-sewn upholstery of the finest aniline leather – a very high seating comfort. Due to its proportions the armchair is reminiscent of a classical club armchair, but in a modern and contemporary interpretation thanks to its striking rounded rhomboidal profile form. The surface of the delicate side table is made out of emperador marble and rests on a frame of white oiled ash wood, which has the same edges as the frame of the armchair. The new table Medeo produced by Zoom by Mobimex radiates an elegant cosyness at home. Marble and solid wood merge in a new fashion. 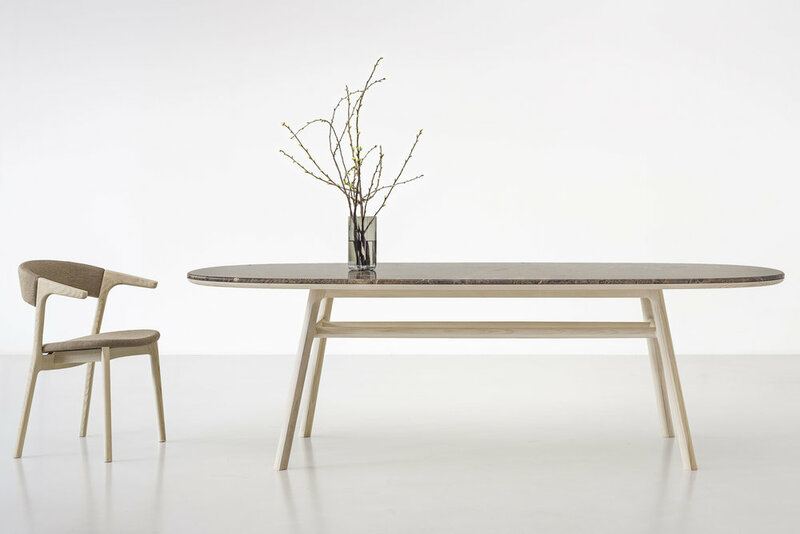 The unique shape of the table top is a combination of circular, rectangular and oval geometries aimed to create an ideal communication setting for smaller and larger groups. The Medeo Table designed by Flip Sellin/COORDINATION is set out to be the ideal table for dinners with friends. The accurate handcrafted execution and the selection of high class materials are a key feature of the whole Medeo series.